Customs and custom clearance fees. Although the "Due" stamps were, from the first day of issue, used for their proper purpose, i.e., the payment of postage on unpaid or insufficiently prepaid letters, they were, also from the first day, used for the Cash on delivery payment, and some very large blocks of all values so used may be acquired. I have even seen a full unbroken pane of 100 stamps of the 5 piastres cancelled "Jaffa Parcel Post"! 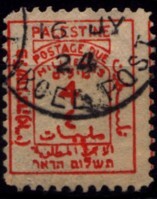 Where the postage on an inland letter or packet in Palestine is not prepaid, or is insufficiently prepaid, the postage charged on the letter or packet shall, subject to any Regulations hereunder, be double the amount, if the postage is not prepaid, of the sum otherwise chargeable thereon, and, if it is insufficiently prepaid, of the deficiency. Where the postage or any other sum chargeable on any postal packet is not prepaid by the sender or is insufficiently prepaid, the postage, or sum, or the deficiency, as the case may be, shall be paid by the person to whom the postal packet is addressed (in this Ordinance styled the addressee) on the delivery thereof to him; or, if the postal packet is refused, or the addressee is dead or cannot be found, by the sender. A packet [letter, postcard, printed paper, &c.], if posted unpaid, is charged on delivery with double postage; if posted underpaid, with double the amount of deficiency. The sender is legally liable for any charges properly made upon a packet which has been posted either unpaid or underpaid, and, if the addressee cannot be found, or if he refuses to pay the charges or accept the packet, the charges can be recovered from the sender by legal process. No one to whom a letter or other postal packet is tendered for delivery should pay any charge demanded in respect of unpaid postage unless a date-stamped postage due label (or labels) to the face value of the charge demanded is affixed to the cover of the packet. A total of five values (1, 2, 4, 8, and 13m) was printed in typography by the printing shop of the Greek Orthodox Convent of Jerusalem. 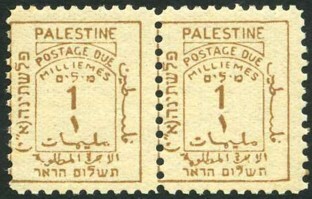 The stamps show a simple but expedient design: panels in an outer frame show "Palestine" in English (top), Arab (right) and Hebrew (left). The English "Postage Due" is positioned in an arch at the top; the Arab and Hebrew equivalents are on the bottom panel of the frame. The centre of the design shows a European numeral and (in reduced size) its Arabic equivalent. The English and Hebrew designation of currency are arched on top of the large numeral, the Arab however is right at the bottom of the central panel. 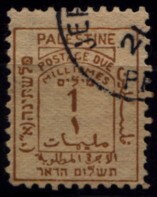 Some of the inscriptions were set incorrectly by the printer: all values, including 1m, show MILLIEMES, conversely the Hebrew is always in singular. In Arab it is all plurals again: Milimat, instead Milim (1m) or Milimen (2m). The print sheet consists of two panes of 10x10 fields separated by an empty gutter. Apparently the plates were constructed by duplication of original strips of five clichées. Five characteristic types, each distinct to a value, can be discerned. For the print two types of paper were used, both without any watermark: white paper with whitish gum (Bale Mandate type A; all values), and brown paper with darker (brownish) gum (type B; all values). One may conclude that there were two separate print runs using the paper at hand at the time. The sheets were perforated manually in line perforation (L11) which lead to very irregular stamp sizes and a plethora of perforation errors. 1m on yellowish paper (Bale D1B) in pair. 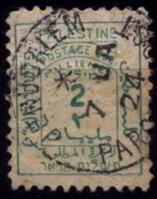 Right stamp in variety 'missing N dot'. 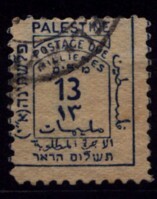 The stamps were issued on or before 1.04.1923. Although some catalogues, including Darlow, list April 1st, specialized catalogue Bale Mandate gives a rather vague date: "Issued perhaps before 1st April, 1923". 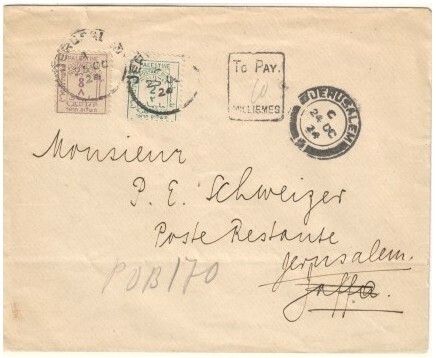 Unfranked letter, sent poste restante to Jerusalem. There the address was changed to a PO Box. Arrival mark JERUSALEM / C / 24 OC / 24 and surcharge handstamp TO PAY. / / MILLIEMES (Sacher L6) with manuscript "10". 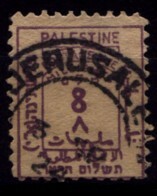 The surcharge is covered with two postage due stamps: 8 Mils (SG D4) and 2 Mils (SG D2), both cancelled with datestamp JERUSALEM / A / 25 OC / 24.